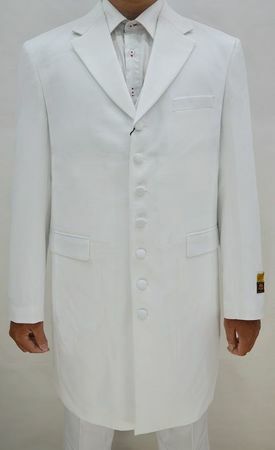 This Zoot Suit for Men White 3 Piece by Alberto Zoot-100 is not your ordinary white suit. This is the style suit you want to wear when you want to go out and make a statement. Once you put this on with a pair of two tone or solid dress shoes you will be the envy of everyone who sees you. Featuring the classic long jacket with matching vest and baggy pleated pants. Made of Poly/Rayon.